I don't know about you guys, but I always have a pair of sunglasses in my cars. You never know when you need them to prevent yourself being blinded by the sun while driving. It's more comfortable to be able to drive without squinting your eyes all the time. But you got to have some place in the car to put those sunglasses. Some cars come with a special compartment for glasses within reach of the driver and that is ideal. The Corolla coupé sadly doesn't have anything like that and there are not really that much suitable places to leave big items like sunglasses. 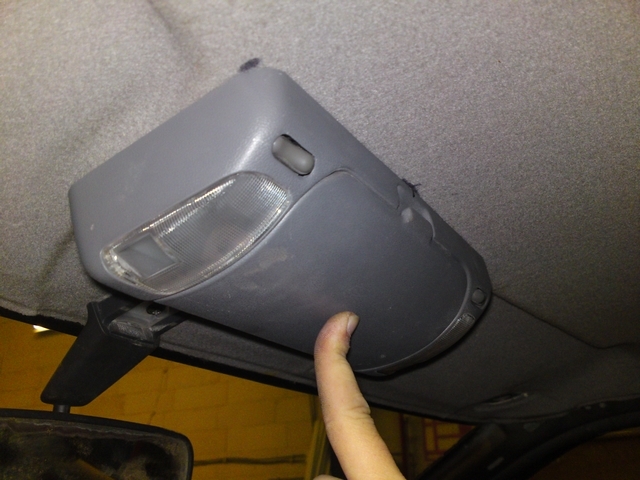 My old Toyota Carina E GTi did have such a compartment on the roof near the rear view mirror. It was a sunglass compartment with two reading lights integrated into it and I kind of liked it. It was very useful in the Carina. So when I ran into a Carina in the junkyard that also had such a compartment, I took it with me thinking I might be able to use it in the Corolla. But I'd have to modify the roof liner a bit and a special bracket would have to be welded to the roof of the car to be able to mount the compartment in the car. The center section of the roof liner would have to be widened to be able to accommodate the compartment. 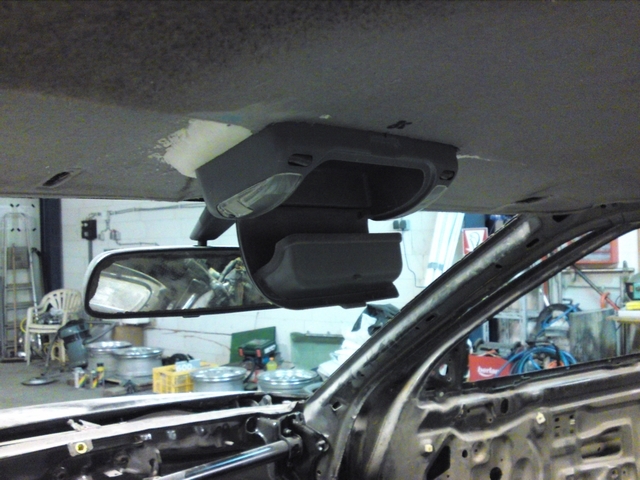 I measured out if the compartment would actually fit and if I would have enough room between the roof of the car and the roof liner to fit the bracket. It turned out it would all fit and this was a feasible idea, so let's get cracking. 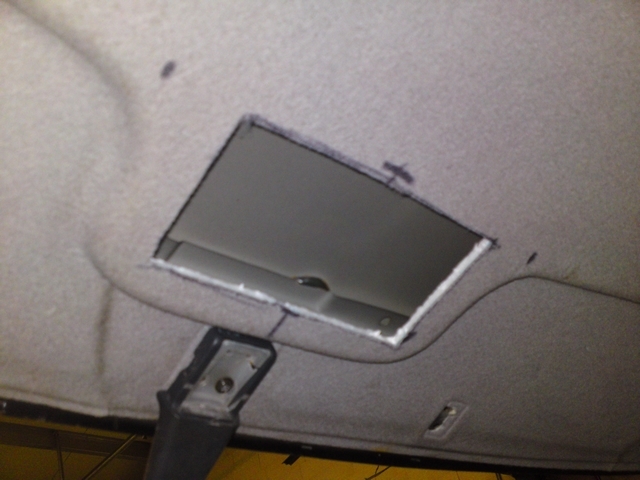 I cut out a hole in the roof liner where the bracket would sit. The picture above is how it should sit on the roof liner. 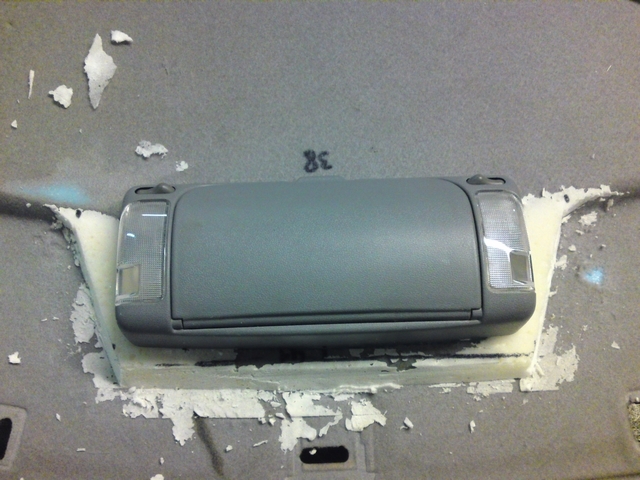 But as you can see, the compartment is bigger than the center section of the roof liner. So that will have to be modified, and I was going to use PUR foam again to reshape it. After it is reupholstered, it will look like Toyota made it that way. 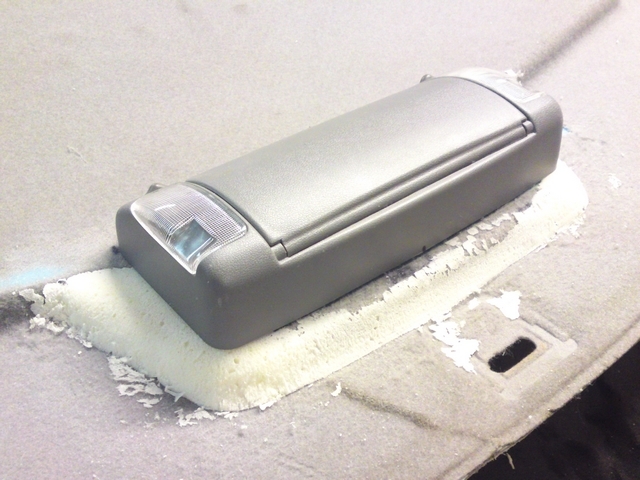 I used a sharp knife the trim down the PUR foam to reshape the roof liner. And after some more cutting, and sanding with very fine sandpaper the final shape emerged. 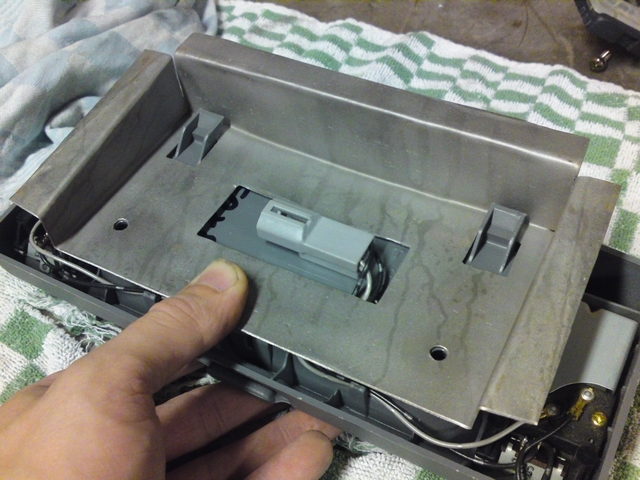 Now for the bracket I would have to fabricate to mount the compartment to the roof. 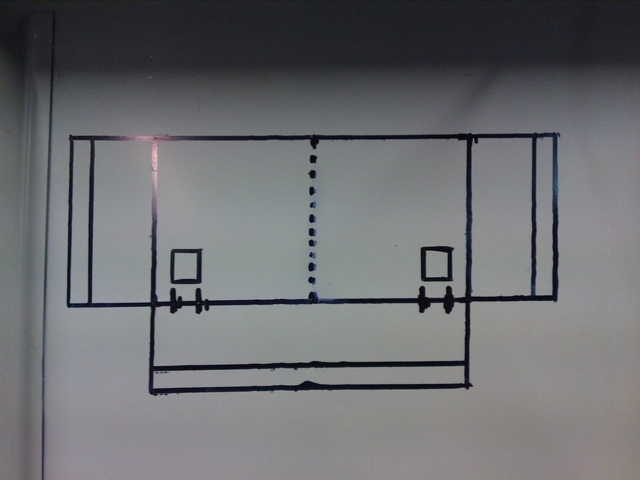 After some measuring, I came up with a design that should work and transferred it to a piece of sheet metal. I could cut it all out and bend it into shape making the bracket out of one single piece of steel. That bracket then got welded to the roof of the car. Now I could install it all in the car to see if my measurements were correct. It fitted just fine. My sunglasses will have their own special compartment so I'll always know where to find them and be able to easily grab them whenever the sun pops up for more comfortable and safer driving. The integrated reading lights are a nice added bonus too. There are little switches on both sides so the lights can be turned on and off with the switches. But I want to see if I can make them switch witch the interior lighting as well when the doors are opened and closed. 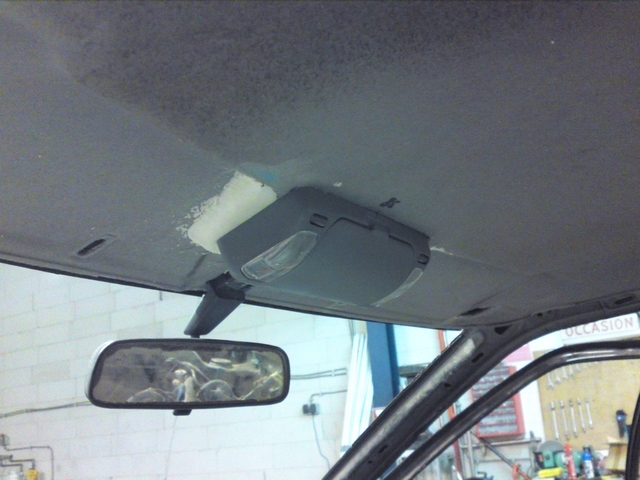 I will probably have to modify the sun visors a bit as well to clear the newly shaped center section of the roof liner. But for now, this has turned out great. 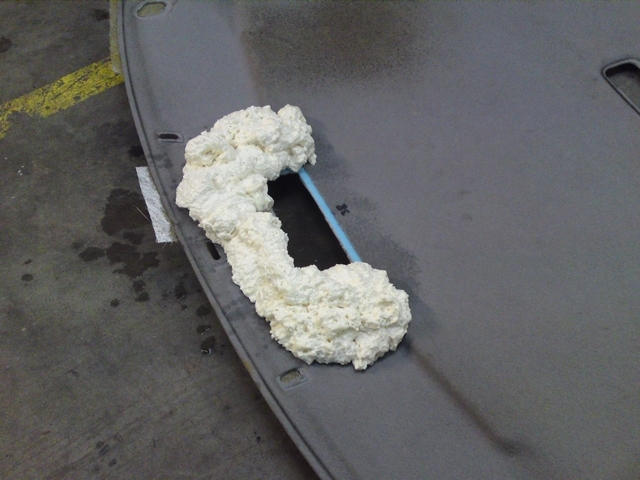 The roof liner will have to be reupholstered first.